“In the beginning of meditation, lights of various colours, such as red, white, blue, green, a mixture of red and green lights, etc., appear in front of the forehead. They are Tanmatric lights. Every Tattva has its own hue. Prithvi Tattva has yellow colour. Apas Tattva has white colour. Agni has red colour. Vayu has green colour. Akasa had blue colour. The coloured lights are due to these Tattvas only. Sometimes a big sun or moon, or lightninglike flashes appear in front of the forehead during meditation. Do not mind these appearances. Shun them. Try to dive deep into the source of these lights. Sometimes Devas, Rishis, Nitya Siddhas will appear in meditation. Receive them with honour. Bow to them. Get advice from them. They appear before you to help and give you encouragement. In the beginning of meditation and concentration you will see in the centre of the forehead a resplendent, flashing light. This will last for half or one minute and then disappear. The light will flash either from above or sideways. Sometimes a sun of 6 inches or 8 inches in diameter with or without rays will be seen. You will see the form of your Guru or Upasya-Murty also. When you get glimpses of the Self, when you see the blazing light, when you get some other extraordinary spiritual experiences, do not fall back in terror. Do not give up the Sad-hana. Do not mistake them for a phantom. Be brave. March boldly with joy” says Swami Sivananda in one of his articles on Meditation. WHAT IS YOUR EXPERIENCE IN MEDITATION? Everyone, who has ever tried to meditate knows how difficult it is to bring this dragon of mind under one’s slight control, what to talk of experiences. Majority of the first timers in meditation are so bogged down by this phenomenon called mind that they think it’s better to go fishing or listen to a soothing piece of music rather than sit in lotus posture on a meditation mat to tame this invisible nuisance-creator – The Mind. Mind’s ways are peculiar and who understands that better than the eastern mystics and Yogis who not only deeply studied the patterns of the erratic mind but also discovered wonderful ways to bring this mind to its legitimate stature of a Servant! This 3 Hr programme on Dharana gives you clearer understanding of the techniques you can use to control your mind better. Can’t Concentrate BUT YOU CAN Meditate! In fact There are two diagonally opposite methodologies adopted by the eastern Masters to tame the devil – One has its roots in Yoga and the other in Tantra. Although there are stark differences in these two yet somewhere Tantra has liberally and successfully integrated the static and dynamic ways of meditation and therefore Dharana is synonymous with ‘Meditation’ in Tantric scriptures. A common student of Patanjali Yoga knows a sequence that places concentration before meditation. This translates to – If you can’t concentrate you can never be able to meditate. This is perfectly true but since ways of minds are innumerable hence there are other ways to meditate for sure. Did you hear me saying ‘You can surely skip practice of concentration to be able to enter meditation?’ Yes! This is exactly the point. Dharana – Using the Power of Mind! ‘Mind over matter’ is a very common phrase. A strong and controlled mind is capable of healing chronic and life threatening diseases. But this same mind, when not in control can become the biggest obstacle when one tries to practice meditation. A Tattva Shakti Vigyaan practitioner knows how delicately the mind is placed in the cosmological map of existence that is the 36 Tattvas. The mind is the origin of Jnanendriyas (Sense organs) , which further form the karmendriya (Action organs), from which originate the Tanmatras (Subtle organs) and finally the Panch Mahabhutas (material elements) are formed. The mind itself originates from Buddhi (Intellect) and if we trace the map towards its origin, we come to know about Ahankara (Ego), Pakriti(Nature), Purusha (Individual soul) Maya(Illusion), the five Kanchukas( the five limitations) and the five Shuddha Tattvas (Pure Elements) and reach right till the Shiva Tattva (Pure Consciousness). The mind has the capability to move in any direction, but we mostly find it attracted towards material side as it becomes stronger when it enters into the cycle of formation. While moving towards the Pure Consciousness makes the mind lose its identity and is certainly not an easy journey for it. When you have control over your mind and can focus and concentrate on anything you wish for long period of time, it means you have perfected the practice of Dharana. The Dharana in itself converts into meditation, triggering the journey towards Pure Consciousness. You will be given practices to calm the continuous chatter of mind and perfect your concentration in the Dharana Workshop. So that the art of keep mind over matter is achieved. Since the practice of concentration is not possible unless the activity involved is of interest you would be given some utterly simple but effective ‘Active-Handles’ to gain the firm grip over your mind and loads of useful information on how mind works that you would love to put to test. How Prana Fuels the mind – Useful tips on it! 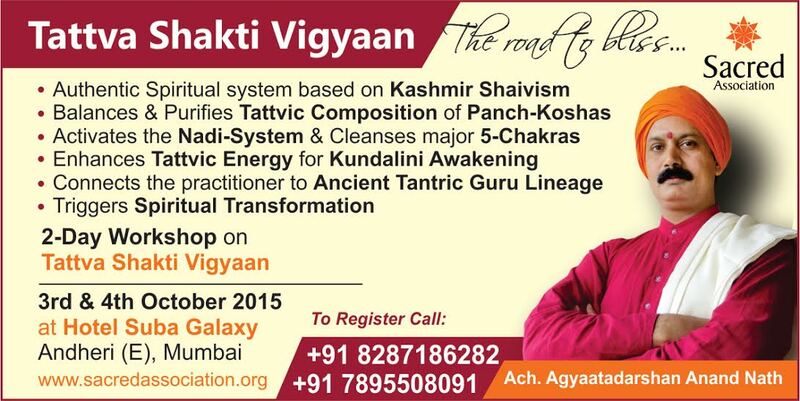 It is a 3 Hour LIVE Interactive Workshop taken on Skype Session by Acharya Agyaatadarshan Anand Nath. More info & How to register? Growing with Karma and Grace! It has been since long I was contemplating of writing my thoughts to be able to share it with you all. The wonderful experiences I have been going have made me realize the magic of ‘being under the guidance of my Gurus’. There are plentiful of experiences of Sadhana but without dwelling in specifics (as that is not permitted for us to share that with anyone except our Masters) I can say that I have been feeling very liberated for the past few months. There’s a kind of fluidity in the way my inner environment is changing… after talking with Acharyaji once and following up on his directions I really feel big change has happened in my perspective. I surrendered to Shiv Shakti completely. This courage has come to me only overtime.. if I look back, the kind of attitude I had I couldn’t ever dream of me taking such a move ever in my life. During one of my personal consultations Acharya ji asked me to recite a piece of Ramayana on certain days in a week. This! Sunderkand path helped me tremendously. I had no idea how powerful this text can be. While reciting it I felt like I am surrendering with my whole body and soul just like Hanuman. I don’t want to sound pompous and fake but I really felt that Hanuman was in me. It was such a divine feeling, brought tears in my eyes. I thank my Guru for this. I was not like this. Tattva Shakti Sadhana does have something mysterious about it but more so I feel it is grace of Gurumandala that works! Over the two years.. finally I feel I have dropped judgements on people for the most part. I am not 100 % free yet on that issue. If there is sense of judgement or forming of an opinion coming up it quickly develops into empathy and love for that person. Each one of us can achieve this with the blessings of Masters. One of my observations on my sister/brother sadhaks and even non sadhak’s struggle is about understanding the art of giving. Giving in terms of finance and volunteering. I feel, lot of them are looking for opportunities everywhere but fail to see that it is right in front of them. In the beginning I also might have had a blind spot but since the day when I decided to GIVE, the whole Gurumandala appeared to remove my confusions. I am no one to preach but with my own experiences I can say.. Guidance is waiting to happen. It will only happen when we open our palms and let go of the money. Money is given by mother divine for us to use in good deeds. Once we take care of our family’s basic needs, we don’t need to worry about money. It is about the art of detachment from money and also relations. To let go of money is much easier than letting go of your near and dear ones. Letting go of near ones absolutely doesn’t mean not loving or caring for them. OPEN YOUR PALMS TO GIVE. THE DIVINE MOTHER IS WAITING TO OFFER! Please forgive me if my language might not be right but I say it with all my heart and love. I haven’t posted anything on the blog before but I really felt maybe others should read this. Thank you so much for being part of my life! Additional Mention – Like each one of you, I am looking forward to meeting Guruma & Acharya ji in the upcoming retreat at Majkhali. From some time my sadhana is not happening on a regular basis as I have been swamped with some volunteering work helping the girl scouts. I know.. I and you have the Masters helping and looking out for us always.. In deep gratitude for their grace and love. Preeti is a dedicated Tattva Shakti Vigyaan Sadhika from New Jersey, USA. She has been gracefully taking up every possible opportunity to help people around and especially support the causes of Gurumandala. 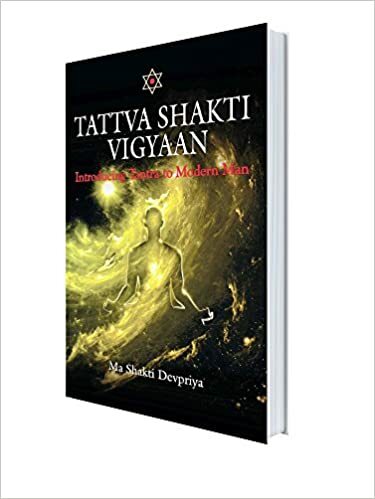 Decoding Navadurga : The Tattva Shakti Vigyaan way..
Decoding Navadurgas – The Tattva Shakti Vigyaan way.. The day two is linked with Brahamcharini. Brahmcharya being linked to swaadhisthan chakra thus as per #TattvaShaktiVigyaan this aspect of Shakti is linked with jala-tattva. Meditating upon this form of Goddess benefits in emotional healing & relationship issues along with strengthening one’s character. Wishing you a Very Happy New Year 2015! Upcoming Workshop in Delhi – Saturday, November 8th, 2014.
via Upcoming Workshop in Delhi – Saturday, November 8th, 2014. The much awaited Tattva Shakti Vigyaan workshop at Mumbai was commenced in Vastu Prestige, Andheri (West) on Sunday, 2nd March 2014. It was well attended by enthusiastic and serious seekers of divine fragrance. This programme was well supported by dedicated efforts of many humble volunteers of Sacred Association and reflection of a great teamwork of divine TSV practitioners of Mumbai. May the blessings of Masters be upon each one you who presented yourselves in this Holy Gyaan Yagna and contributed to the charitable initiatives of Sacred Association.